Flossy's produced this size bag over 10 years ago. It is a great single serve bag, just enough to enjoy and feel satisfied. Our standard in stock colour combinations are Pink and Pink/Blue. You are purchasing 1 bag of handcrafted 30g fairy floss @ $1.65. You can buy boxes with 10, 20, 60+ bags per box. 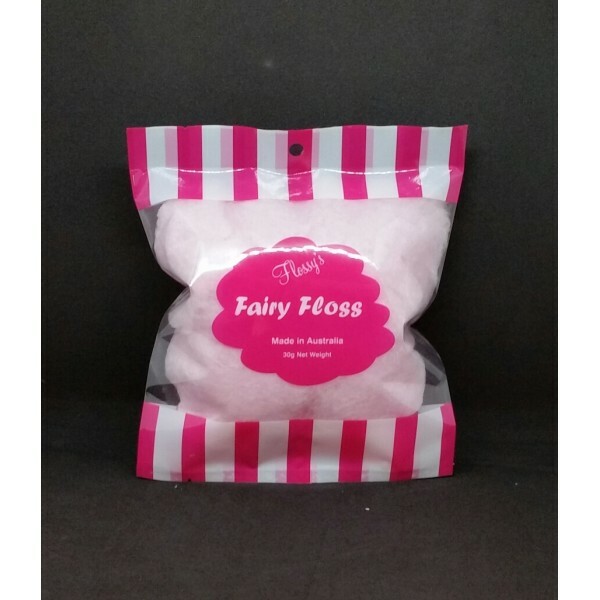 Please note that Fairy Floss does not ship when the temperature is 25+C and will be held till the weather cools down. Other colour/flavour combinations (listed below) have a 30 bag minimum. Please choose a colour/flavour and add to cart. For multiple purchases choose each combination and add to cart.